Put a smile on your sponsor child's face by sending love. Download our template or use your own creative template to write your words of encouragement, hope, and love. Use the form to attach your scanned letter or write a personal message to your child in lieu of scanning. HERE ARE SOME OF OUR MOST FREQUENTLY ASKED QUESTIONS. IF WE DIDN’T COVER SOMETHING, PLEASE FEEL FREE TO CONTACT US. 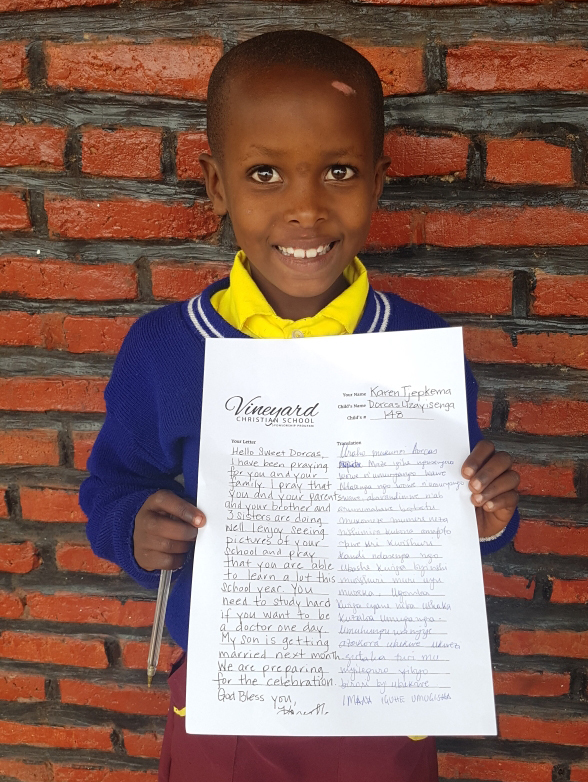 Letters from your sponsored child will be handwritten by them, scanned and emailed to you. If you have a child that is too young to write, they may receive assistance from their teacher or one of our staff members at Vineyard Christian School. It is important that all letters go through the sponsorship program. This allows for the correct translation that you and your child need for positive communication, it will protect your privacy, and it protects the child. How often should I write my child? You may write to your sponsored child as often as you like. You will receive a minimum of two letters a year from your child. Please remember to write your child’s name and sponsor number on the letter. – Talk about important events — weddings, graduation, trips, new jobs, holidays, etc. What topics should I avoid writing about? Please never make promises to your sponsored child. Even if your intentions are good, we never want to make a promise, even if we intend to keep it. We understand that “life” happens, but these children will hang onto every word you write. Suggesting that you plan to take a trip to visit them, bring them to America, adopt them, or buy them special gifts is never a good idea. If the sponsorship coordinator feels that your letter and/or photos contain the above potentially harmful topics, we will contact you. Can I communicate with my child via social media? Currently, the village has no electricity. There are no computers and no way to communicate on mass media. However, in God’s perfect timing, the future might hold access to these things. For your protection and the integrity of the Vineyard Christian School Sponsorship Program, we ask that you do not add your sponsored child or any child in the program on Facebook or any other social media network. Requiring all communication to be funneled through our sponsorship coordinator allows us to protect both the sponsors and the children. Sadly, some children will try to take advantage of your generosity. Communicating with them in an un-monitored outlet like Facebook opens the door for uncomfortable and even harmful scenarios for you and the child. Because of the conditions of the village, we are asking that you only send letters and pictures. Our reason for this is for the child’s protection. While it might seem “fun” to send a gift, it is not good to be singled out in an impoverished area. Many times it causes jealousy and discrimination. Since we want our involvement to be positive, it is best to keep it simple. We do have hygiene kits and food baskets available on the website for gifting. These packages were designed with the needs of the children and their families in mind. If you choose to purchase one or both, they will be delivered to your child’s home. This is something that can be repeated as often as you feel led. The hygiene kit costs $15. This kit includes a toothbrush, toothpaste, washing soap (3), bathing soap (4), Vaseline (4 small containers), toilet paper (4 rolls), handkerchiefs (2), socks (2 pair), and underwear (4 pair). The food basket costs $20. This will include items such as rice, beans, small fish, oil, sugar, etc. The contents may vary depending on the availability and specific family needs. To give one of these items, go to our Donate page. Should I send my child pictures? Absolutely! You can send landscape photos, artistic pictures, pictures of your pets, your family and friends, etc. Please avoid sending pictures that may accentuate the economic differences between you and your child (e.g., homes, cars). It is important to be aware of what is in the photo’s background. If you happen to send a photo that the sponsorship coordinator feels is inappropriate, it will be returned to you.